We sincerely wish each of you a Merry Christmas and wish you and your family a wonderful holiday season and prosperous new year. process of outfitting all terminals with Avery Weigh-Tronix legal-for-trade Forklift Truck Scales. In addition to ensuring accurate billing, the scales’ accurate weight verification enables dock workers to load the trucks evenly and legally, which avoids overload fines, excessive wear on the vehicle, and unsafe operation. Avery Weigh-Tronix Legal-for-Trade Forklift Truck Scales transform ordinary lift trucks into mobile scales that deliver instant legal-for-trade weight verification of each load upon pick-up. 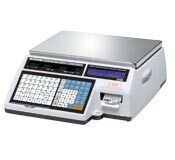 They are designed for industrial use, the field-serviceable scales feature solid steel Weigh Bar® weight sensors, a rugged electronic indicator, and an epoxy-painted scale carriage frame. The proven Weigh Bar technology connects the front and back scale elements, eliminating flexures, and reducing maintenance costs. 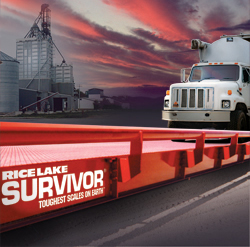 Rice Lake Weighing Systems was recently granted an amendment to its NTEP Certificate of Conformance for the SURVIVOR OTR Series of above ground truck scales. The amendment reduces the scale’s minimum division value (emin) from the industry standard 20 pounds to 10 pounds, making the SURVIVOR OTR suitable for not only vehicle weighing, but high-dollar applications such as livestock and scrap-metal weighing. The improved resolution is essential where valuable commodities are being weighed and Rice Lake’s truck scales now offer a competitive advantage in those cases. The positive reviews just keep pouring in regarding the Doran FC6300 scale. What would it be like to be in total control? Imagine saving at least 1.8% of your yearly minor ingredient costs. What would that be worth to you? Picture having an extra supervisor watching over your employees’ shoulders monitoring and controlling the formulation process while the employee hand scales ingredients. What effect would that have on your product consistency and production efficiency? Doran’s FC6300 Formula Control System puts you in total control and can pay for itself in just four months or less. Just take a look at a few of the scale reviews.